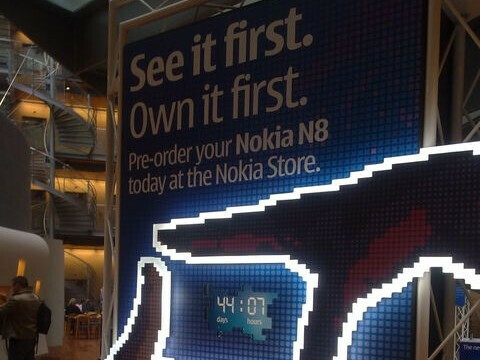 Nokia counts down to July launch of N8? Back on April 27th, Nokia introduced the Symbian^3 powered N8 handset. Now, according to a countdown clock put up at the manufacturer's HQ in Helsinki, pre-orders for the phone are supposed to start in 44 days. That would take us into July. Originally expected to launch in August, the device is equipped with a 12MP camera and stores up to 16GB of memory. Figuring Nokia's standard 6 weeks between pre-sale and launch would mean that the N8 would be in consumers hands in September, and lo and behold, that brings us to Nokia World 2010. Perfect timing for the Finnish based firm to launch this important device-with the spotlight on them. Nokia fans, want to look forward to the N8? As we reported, the device could run as much as 180% faster than the Nokia N97. The excitement will soon begin!! well lets just hope it is not a 'false dawn' like the n900.... 'for sale' on nokia website and many others, a few managed to buy it, but it was then 'not available' for a long time.... very limited phone functions untill one update corrected that... - or the 'first release' of the 5800, that hd plenty wrong with it, took about 4 or 5 software updates over the years to *finally* get it working properly!! !